Meet Bre’Anna, a rising sixth grader from Atherton Elementary. She is an avid reader: “Every time I finish my work early or if I have free time in class, I will read.” So excited to participate in My Home Library, she did not know which books to choose. Even though there were a lot of options, Dork Diaries stood out to her because it shows her the potential obstacles of middle school. When Bre’Anna is not in school, she loves to play outside. On an average day, you will find her with a basketball in her hand or running around her neighborhood. You may also find her reading outside, especially when the weather is cooler. Her favorite color is peach and her favorite animal is a rabbit. 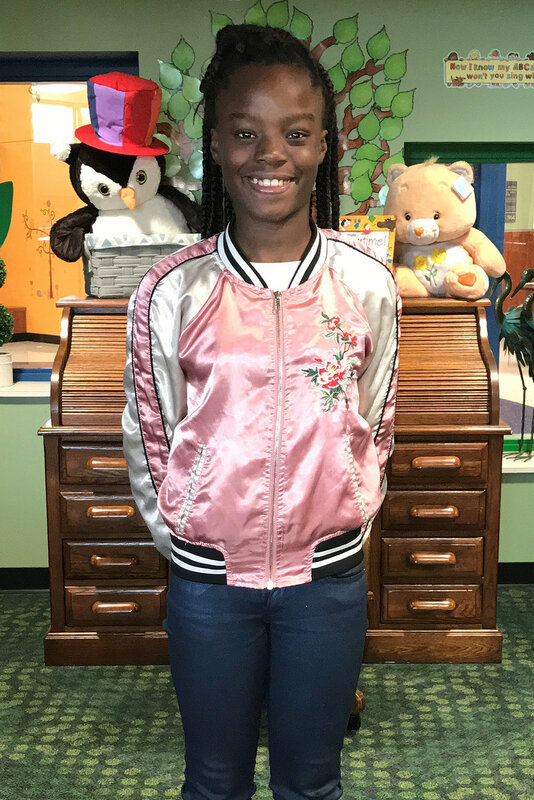 Like many students at Atherton Elementary, Bre’Anna does not have that many books at home and rarely gets brand new books. Participating in My Home Library made her feel special because she could choose books that were made and bought specifically for her. Ellen Barth went to Stratford High School in West Houston, and now she currently attends The University of Texas in Austin. Ellen explains her relationship with literacy and learning: "It wasn't a struggle for me to learn how to read because I am super competitive. Whenever I saw other kids in my grade learning how to read, that quickly made me want to learn how to read bigger chapter books than they were reading. I also think that encouragement from siblings and family is a big part of it. I grew up with an older brother so being able to keep up with him and be on his level was something that I wanted to do. My parents were also very encouraging; we would take trips to the library as a family." Ellen believes that part of the problem with literacy in Houston comes from where you live. "Being from Houston, I think there is a big gap between different school districts. I grew up in Spring Branch, and I believe that Spring Branch does a really great job in incorporating literacy into all grades," said Ellen. "Not all school districts are providing this though." Clayton Homes site coordinator Joice Smith explains why she got involved in the literacy cause: "The era of parents that we have is more concerned with drug and alcohol addiction rather than teaching their kids to learn. That plays a huge part in their kid’s personal lives and their ability to thrive and strive to do better. The parents are the image of what their kids see. And if that is all the kids see and know, they do not think about getting involved with their school or attending summer reading camps." But Joice is determined to overcome that obstacle, with the help of the Barbara Bush Houston Literacy Foundation, where they have teamed up to host Summer Reading Camps. Chaitali Dave was born in India, grew up in Zambia and moved to the United States when she was 12 years old. "I like to read a lot. When I moved to the U.S., I didn't know anybody, so I sort of became an introvert and started reading a lot. That's when I really learned that I love to read." Chaitali works for Phillips 66 and enjoys volunteering through the Junior Achievement program. She has taught first, second and fourth graders. "I have always enjoyed working with kids and volunteering with the companies that I have worked for," she said. "I believe that kids just think that they can look on the Internet to get answers to everything. I think that some kids are faking what they know in order to get by. If you cannot understand what you read, then you do not know how to read. The problem these days is kids can put words together, and they just keep moving on through the process but eventually it catches up to you. They do not understand the simple vocabulary that they need to know. I have even seen adults in groceries stories who do not know how to read, and they get lost and confused when the labels change. It's unfortunate, because as great as our country is, literacy should not be a problem. But it is."